Honeybees play a critical role in our food system, pollinating a third of the crops we eat, including tree nuts, stone fruit, and many other fruits and vegetables. By harvesting their honey, we also get to enjoy the sweet products of their nectar-gathering labor. To prime you for tomorrow’s Honey Celebration, we’ve collected some delicious tidbits to help you sweet talk like a honey connoisseur. Honey is a food made by honeybees from flower nectar. Flowers produce this sugary substance to attract insects and birds, which help plants reproduce through pollination. A worker bee goes from flower to flower, gathering nectar in her honey sac, while pollen collects on her legs. In the honey-making process, bee enzymes break down the sugars in nectar and transform it into honey through a process of regurgitation and evaporation. A female worker bee produces about 1/12 of a teaspoon of honey in her lifetime of just a few weeks. To produce one pound of honey, bees must visit about 2 million flowers! In addition to making honey, bees secrete beeswax from their abdomen to create hexagonal honeycomb cells in their nests or hives, which they use to store honey and pollen and raise their young. Honeycomb starts out white and then becomes more yellow as honey and pollen accumulate. In addition to honey, bees produce several other products that humans have used as food or medicine. Bee pollen is pollen that has been collected by bees then combined with nectar, enzymes, fungi, and bacteria and packed into granules as a high-protein food for the hive. Propolis is a sticky resinous substance collected from trees and other sources. It is used to seal small spaces in the hive and has antibacterial and antifungal properties. Royal jelly is essentially honeybee baby food. Secreted from the glands of worker bees, royal jelly is fed to young bees for the first three days of their lives, while the queen larvae are nourished on it throughout their development. For humans, royal jelly is sold as a dietary supplement and used in beauty products. Honey is, of course, the bee product with which people are most familiar. To extract honey from the hives, a beekeeper generally pacifies the bees with smoke and removes the honeycomb, leaving enough honey for the colonies to survive. The beekeeper then scrapes the caps off the honeycomb, where the honey is stored, and harvests the honey using a mechanical honey extractor, which acts as a centrifuge. Once harvested, honey can be processed and packaged in various ways. Most is sold as liquid honey, meaning it has been extracted from the comb. It can also be sold in the edible honeycomb (comb honey) or with pieces of comb immersed in the liquid (chunk honey). From the hive to the market, not all honeys are created equal. 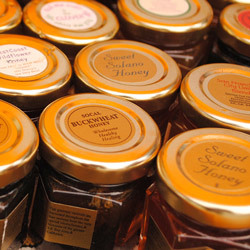 Locally sourced honeys are generally raw or minimally processed. Raw honey in its purest form, unfiltered and unpasteurized, may contain tiny bits of pollen and wax. It is believed to have medicinal and antimicrobial properties and may help to alleviate allergies. Most mass-produced honeys are pasteurized and filtered to remove trace amounts of pollen, kill off any bacteria, and produce a more uniform and clear product. Commercial honeys are often blended, meaning that honeys from different floral sources and locales are combined after they’ve been harvested from the hive. Local or varietal honeys, on the other hand, tend to be minimally processed, if not raw, and harvested from a distinct floral and geographic source. Monofloral describes honey that comes from one type of flower, while polyfloral means that the bees visited a variety of floral sources in the same area. For example, wildflower honey comes from the nectar of different local blossoms. The distinct flavor and color of varietal honeys come from their floral source or sources. Such honeys are harvested seasonally, depending on when the flowers bloom. Light-colored honeys, like orange blossom and clover, are generally mild, while darker honeys, like buckwheat, generally have a bolder, richer flavor. As in wine and cheese tasting, there’s a whole vocabulary to describe honey flavors, from fruity or floral to dry or resinous. In terms of sugar content, honey is primarily composed of two simple sugars, fructose and glucose, and has about the same sweetness as granulated sugar. It also contains trace amounts of vitamins, minerals, and antioxidants. Over time, raw or minimally processed honey may take on a thick, cloudy appearance, known as crystallization, because of the high concentration of sugars and presence of particles like pollen. 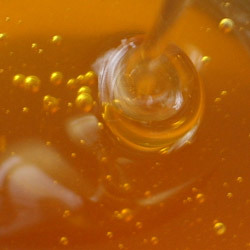 To control crystallization, beekeepers may process honey into creamed or whipped honey, which introduces small crystals that help prevent larger crystals from forming. If your honey crystallizes, it can be returned to liquid state by putting the jar in a bowl of warm water. Do this carefully, as overheating can caramelize the sugars and damage the honey. Honey is naturally stable and doesn’t need to be refrigerated. It should be kept in an airtight container in a cool, dry place, out of direct sunlight. Honey can be used as a substitute for granulated sugar in many recipes, adding its own distinct flavor and color. Begin by substituting honey for up to half of the sugar called for in the recipe. Coat your spoon or cup with oil to prevent the honey from sticking. Baking recipes require more careful adjustment, because honey has more liquid than sugar and because it browns more readily. Consult the National Honey Board’s website for guidelines. Learn more at tomorrow at CUESA’s Honey Celebration. You can find Marshall’s Farm Natural Honey at the Ferry Plaza Farmers Market on Saturdays and Thursdays, and Snyders Honey at the market every other Tuesday. Honeycomb photo by Matthew T Rader. 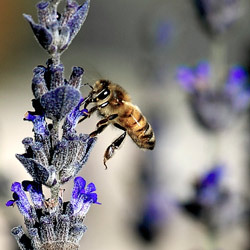 Bee with lavender photo by Danny Perez Photography. Honey pour photo by Slona Karen.